Competitive greatness. Poise. Confidence. Self-control. Loyalty. Team spirit. These traits all lead back to one man: Coach John Wooden. Today the Bruin family gathered outside Pauley Pavilion for the unveiling of a bronze statue of Wooden, whose vision, dedication, enthusiasm and insistence on personal excellence transcended the hardwood and made a mark on people at home and abroad. 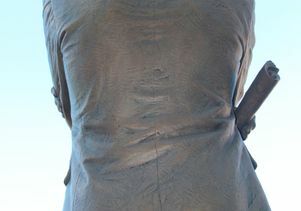 The statue was created by renowned sculptor Blair Buswell, who has crafted likenesses of a variety of famous sports figures for major sports venues, including more than 68 busts of inductees into the Pro Football Hall of Fame and statues of prominent athletes and coaches, among them Jack Nicklaus, Oscar Robertson and Paul "Bear" Bryant. 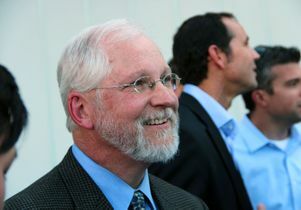 Buswell worked on the project for nearly one year, consulting with the Wooden family and UCLA representatives along the way to ensure that the artwork would be as authentic and true to Wooden’s demeanor as possible. 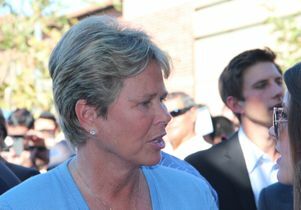 The unveiling ceremony was emceed by former UCLA women’s basketball star Ann Meyers Drysdale, who spoke of the quality time she and her family spent with Wooden, whom she affectionately calls "Poppa." 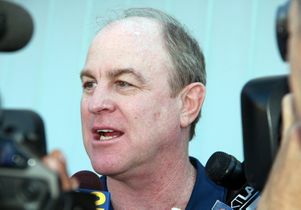 His unwavering influence made her a better player and a better person, Drysdale said: "When he spoke, people listened." 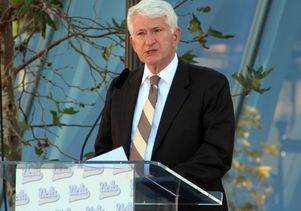 Wooden’s storied 27 seasons with the Bruins included seven consecutive NCAA championships between 1967 and 1973, and 10 titles in his final 12 seasons as head coach. Wooden retired from coaching after the 1975 season with a record of 620 wins and 147 losses. 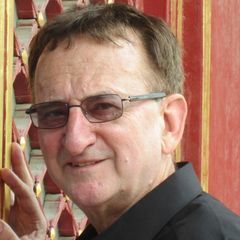 His Pyramid of Success, a how-to guide to succeed in all facets of life, is known around the world. Wooden passed away on June 4, 2010, at the age of 99. 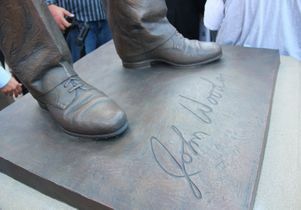 A monumental record like Wooden’s deserves to be monumentally remembered, UCLA Chancellor Gene Block told a crowd of several hundred people who waited in anticipation to see the 8-foot bronze statue unsheathed. "Coach had a positive and lasting impact on this entire campus, on the greater community off-campus and on millions of people around this country, indeed around this world," said Block. 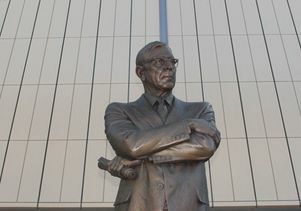 "Now, with his statue in its rightful place, Coach will be able to stand vigil and welcome countless visitors and fans and athletes, not only to Pauley Pavilion but also to the wonderful world of achievement, integrity, humility and success. 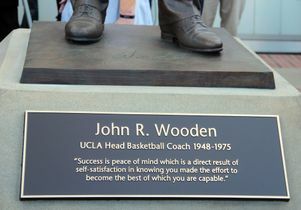 That is Coach Wooden’s unique and lasting gift for all of us." Memories of Coach Wooden and the impact he has on those around him were also publicly shared by Dan Guerrero, UCLA’s director of athletics; Jim Collins, a member of the Pauley Pavilion Campaign of Champions Committee who leapt at the opportunity to fund this project in honor of his good friend John Wooden; and David Bocarsly, council president of the Undergraduate Student Association. Wooden’s children, Nan and Jim, also offered their remarks. Despite all the accolades and honors received by their father during his illustrious career, this is by far the most meaningful to the family, said Nan Wooden following the ceremony. "To us, this is probably the biggest honor that has ever been," she said. Her father wouldn’t have felt as though he deserved such a fuss; after all, it was his players who won championships, it wasn’t him, she said. 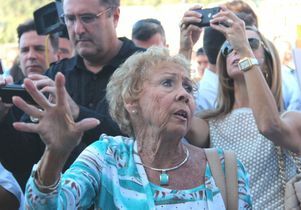 Grandson Greg Wooden added that despite his grandfather’s humble and grounded nature, this was an incredibly special day for all of his descendants. “For the Wooden family, it’s important. For the family and for my daughters and their children to come back here and see this is very, very special. We’re thrilled,” he said. Being there to honor Coach Wooden was also important for the former Bruin hoop stars who also came out to celebrate with the campus community. Among them was basketball great Jamaal Wilkes, who played under Wooden’s tutelage between 1971 and 1974. 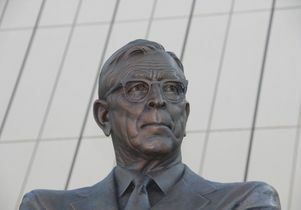 "It captures his essence," said Wilkes, recalling Coach Wooden and those glory days of yesteryear that were spent running drills and winning games. "What I remember most about Coach was that he was very precise, extremely precise, and very intense and just a genius in terms of how he applied what he was teaching us in terms of basketball." Wilkes said that Wooden would have likely shied away from all the attention, not thinking much of it, but that it’s a suitable honor for a man that meant so much to so many. "He probably wouldn’t want it up, but I think it’s appropriate for his legions of fans and admirers, and just people he touched around the world. It’s appropriate." 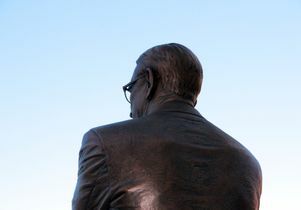 John Wooden statue unveiling outside Pauley Pavilion, Oct. 26, 2012. 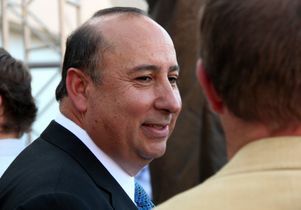 UCLA photo. 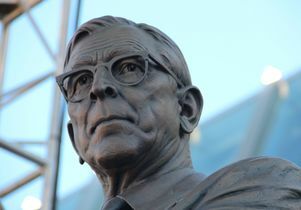 Coach John Wooden statue unveiling outside Pauley Pavilion, Oct. 26, 2012. 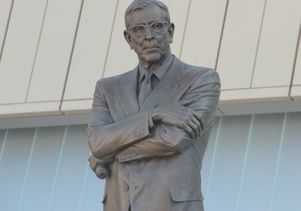 John Wooden statue at UCLA.